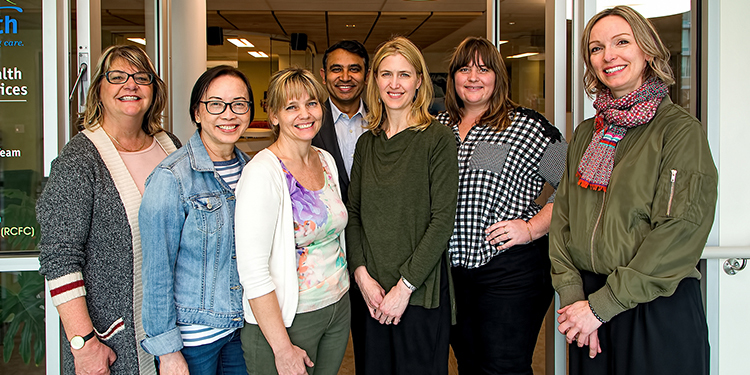 Karen Barclay, manager of the community mental health and substance use program for Vancouver Coastal Health in Richmond, with some of the Anne Vogel Clinic team. Big changes are coming for the treatment of a deadly disease. Currently, it kills three British Columbians each day. Those under medical supervision survive, while those living secretly with their condition at home often do not. Like the diabetics who require injectable insulin, clean needles, and a safe way to dispose of them, people dependent upon opioids can now seek medical help without fear of arrest, without fear of shunning, without fear of condemnation by the medical profession. The recently-announced, new prescribing regulations coming nation-wide will allow doctors and nurse practitioners to diagnose opioid addiction and offer prescriptions to patients for opioid replacement. Family doctors, nurse practitioners and specialists as well as the professionals at the Anne Vogel Clinic will be able to write a prescription for opioidreplacementsthat are clean, safe, and in a known strength, for their patients living with a substance use disorder. Dawar says doctors have options. The clinic, named for a previous medical health officer in Richmond who started the local methadone treatment program in spite of many obstacles, offers services for more than just those with addiction issues. It is located within the Community Health Access Centre which also offers seniors health services, mental health services, and groups for moms. Because everyone waits in the same area, no one knows why a patient is there. The Anne Vogel Clinic is open to all comers including teens. The plan is that no one should have to seek illegal drugs once they’ve been diagnosed and prescribed their meds. For those concerned that these new relaxed regulations around prescribing opioidreplacementsto treat addiction will allow people to try these strong drugs, both Dawar and Barclay are clear. “The approach is that an individual approaches their physician. The appropriate clinical assessment is done to diagnose the illness. From there, treatment options are discussed and a treatment plan made,” says Dawar. Guy Felicella grew up in Richmond. He also grew up in great emotional pain. He eventually found relief in an injectable opioid, heroin. After decades of use, he sought treatment. “What opiate assistive therapies do is they address the physical need to stabilize the person. Once the physical dependence gets addressed, the person isn’t so hell-bent on getting drugs, so they can start piecing their life back together,” Felicella says. Sterile, safe opioidreplacementmeant Felicella could stop stealing $300 to $400 each day to numb his pain with heroin. Anyone who has had a break-in, theft, or their car window smashed has been affected by the high the cost of illegal drugs. The new clinic and regulations may mean the risk of break-and-enters may drop in Richmond. Also, there is no point in selling legally-obtained medication on the street when those who need it can get a prescription filled at a lower price than the black market. Both Dewar and Barclay assure that no one can go to a doctor to just get a prescription for opioid assistive therapy any more than they can pop into their walk-in clinic or GP to see if they could just try insulin or fertility drugs. “I don’t think anybody’s sitting at home saying, ‘I think I’ll go inject some heroin today.’ People don’t just do that,” says Felicella. The Anne Vogel Clinic is definitely not a safe injection site. They do not provide any drugs themselves but they can provide prescriptions that can be filled at a pharmacy. The clinic is a place for those concerned about their substance use to go for a listening ear, help with a safer life, medical treatment, a prescription for sterile meds with counselling and support and to address their opioid addiction without judgement, without the need to go cold turkey. Once a client is ready, compassionate counselling is also available at the clinic. “Right now, we are open Mondays to Fridays opening at 9 a.m. closing at 5:30 p.m. most days but staying open until 6:45 p.m. on Tuesdays and Wednesdays so people can come after work. We hope to be increasing our hours to weekends as well,” says Barclay. Dawar says the clinic offers advice to family physicians and accepts same-day referrals from doctors. “We love it when they book an appointment over the phone but we’re drop-in friendly,” says Barclay. “Even if a client is ambivalent, we’d be happy to meet with them, talk to them about their options. Dealing with an addiction might need a couple of opportunities to know if they are ready to make a change. Sometimes they might need to have that conversation a couple of times,” she says. “When a patient is ready to seek treatment, we are ready to help them,” says Dawar. “I think it also moves the problems into the zone of really what it is, a medical condition. If someone has a physiological addiction, we address that medical problem with a medical solution. Without that, people are having to turn to the black market, the street, where the drugs are unregulated, toxic, and contaminated,” says Barclay. “This is absolutely a step in the right direction,” says Dawar. The Anne Vogel Clinic, at 7671 Alderbridge Way. 604-675-3975.